A man and his equation: the anxiety-plagued nineteenth-century physicist who contributed significantly to our understanding of the second law of thermodynamics. Ludwig Boltzmann's grave in Vienna's Central Cemetery bears a cryptic epitaph: S = k log W. This equation was Boltzmann's great discovery, and it contributed significantly to our understanding of the second law of thermodynamics. 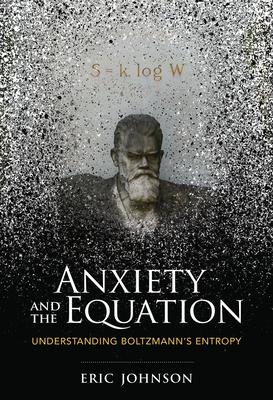 In Anxiety and the Equation, Eric Johnson tells the story of a man and his equation: the anxiety-plagued nineteenth-century physicist who did his most important work as he struggled with mental illness. Johnson explains that "S" in Boltzmann's equation refers to entropy, and that entropy is the central quantity in the second law of thermodynamics. The second law is always on, running in the background of our lives, providing a way to differentiate between past and future. We know that the future will be a state of higher entropy than the past, and we have Boltzmann to thank for discovering the equation that underlies that fundamental trend. Johnson, accessibly and engagingly, reassembles Boltzmann's equation from its various components and presents episodes from Boltzmann's life--beginning at the end, with "Boltzmann Kills Himself" and "Boltzmann Is Buried (Not Once, But Twice)." Johnson explains the second law in simple terms, introduces key concepts through thought experiments, and explores Boltzmann's work. He argues that Boltzmann, diagnosed by his contemporaries as neurasthenic, suffered from an anxiety disorder. He was, says Johnson, a man of reason who suffered from irrational concerns about his work, worrying especially about opposition from the scientific establishment of the day. Johnson's clear and concise explanations will acquaint the nonspecialist reader with such seemingly esoteric concepts as microstates, macrostates, fluctuations, the distribution of energy, log functions, and equilibrium. He describes Boltzmann's relationships with other scientists, including Max Planck and Henri Poincar , and, finally, imagines "an alternative ending," in which Boltzmann lived on and died of natural causes.